Hip Little Dress to wear around your Small, Provincial Town. You can wear it anywhere, actually. We won’t judge. Provincial Town or City Streets. Beast’s Castle or White Castle. What ever floats your boat. This Beauty and the Beast Roses Dress was made for showing off! 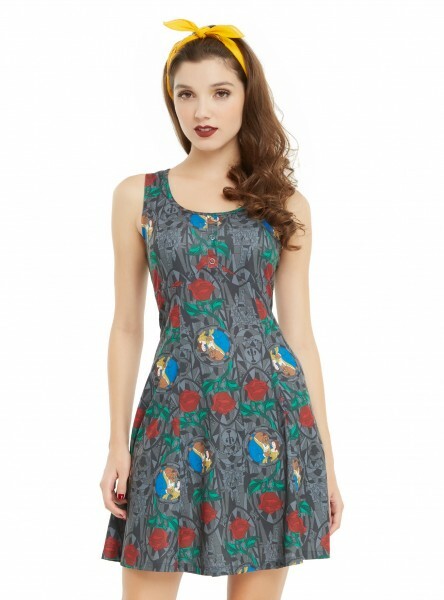 Grab this and other dresses from Hot Topic at 30% off online right now! I bought a pair of leggins in this print and I love them. The dress is super cute, and knowing how soft the fabric on the leggins is, I bet the dress is that way too. Love it.